Dragos can be contacted directly on 07404 393 687 or at conidrafit@gmail.com. My mission is to help people feel better, physically and emotionally. I love to use my knowledge, skills, and expertise to improve people’s health and wellbeing. I am passionate about anatomy, sports and nutrition, the human body and complementary therapies. I am a positive and energetic person always doing my best to meet my clients’ needs. I am highly skilled with a calming and confident approach that always puts you at ease – helping to overcome the stresses, pains and strains of modern life. I aim to bring a sense of harmony and balance to your whole being! Dragos has a wide range of experience as a massage therapist, personal trainer and life coach, having worked for over 15 years as an international body, mind and soul therapist for top athletes. 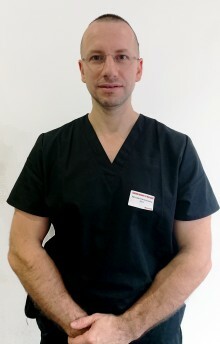 Part of his solid foundation is a DipHE (Hons) in Physical Education and Sport, as well as multiple massage courses at the prestigious London School of Massage and other high education studies leading to a BSc. He is a former professional athlete and currently still active as a master referee and armwrestling expert with the World Armwrestling Federation (WAF). Recently, Dragos decided to travel less and focus on consolidating his practice in London and its surrounding areas so he could help everyone who needs his help, not only top athletes. - the human body, complementary therapies, anatomy, practicing and watching sports of all kind, gym, spending time with my family, travelling, mountain trips, economy, IT and programming. - in my spare time, I am doing voluntary work collecting and sorting food donations for Euston FoodBank since 2015. - I am involved in European and World Armwrestling Federation (EAF & WAF) as a master referee and armwrestling expert. My schedule is flexible and can accommodate your needs.